Is It Legal to Carry Pepper Spray? Pepper spray is a common self-defense tool, but is carrying it actually legal? This is the premise for out newest segment, 'Is It Legal?.' As Las Vegas personal injury lawyers it is our responsibility to remind you that pepper spray is considered a weapon, so there are rules that need to be followed. Pepper spray's active ingredient is capsaicin, a derivative of chilis. It can subdue a person temporarily with symptoms including, burning in the eyes/throat, troubling breathing and sinus discharge. It doesn't work on everyone, though. Some people can "fight through" the spray. In the State of Nevada you CAN carry pepper spray on you, but according to NRS 202.370-390, it is illegal to carry more than 2 fluid ounces, and must be an aerosol spray. Also, minors and felons are prohibited from being in possession the self-defense weapon. As for the rest of the country, pepper spray is legal in all 50 states, but specific restrictions vary. It's also important to note that you should always check your local laws or statutes before carrying any sort of weapon. And just because you have one, it doesn't mean you're invisible. Have more legal questions? We've got answers. 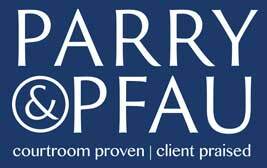 Contact Parry & Pfau today—the initial consultation is free. Newer PostIs It Legal to Buy Cigarettes Online?